Termination letters are formal documents written by an employer if he/she wants or needs to fire or terminate an employee from the company. Terminating an employee may be caused by two common reasons: the employee failed to abide by the company’s terms and conditions or there’s a need to layoff some employees. For whatever reason an employer may have, there’s a need to write a termination letter. Writing a termination letter documents the reasons and justifications why an employee is being fired from his post. 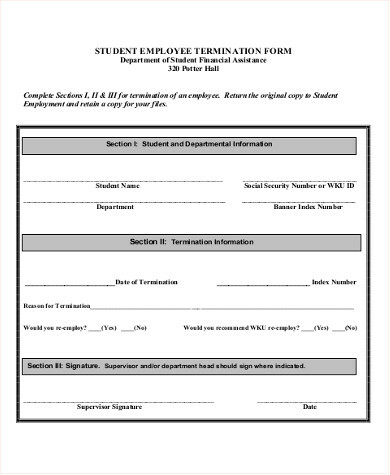 If you are an employer who plans to fire his/her employee or just wants to have forms ready in case a termination situation should arise, our Sample Forms for termination can help you choose the appropriate ways to tell your employee that he/she needs to be fired. Termination letters can be a daunting and time-consuming task to write. They must be written with precision. Always remember that you should be honest with these letters and give full details in order to make your now former employees understand why they have to go through such process. The letter’s language should be formal. The tone should be calm. Wordings should not sound harsh or rude. The first few sentences should mention that the employee is being terminated. Be straightforward. This would help lessen room for doubt and employee can easily comprehend the justifications for the termination. If applicable, list the offenses that were incurred by the employee that made the employer come to the conclusion of termination. Give the reasons why the employee is being terminated. State whether it is due to the employee’s actions or not. Include the end date of the employee and the number of days that he/she still has to render with the company. Set expectations about what would happen upon termination. Discuss matters about pay and benefits. Accuracy in details must be ensured to avoid misinterpretations and misunderstandings of the current situation. 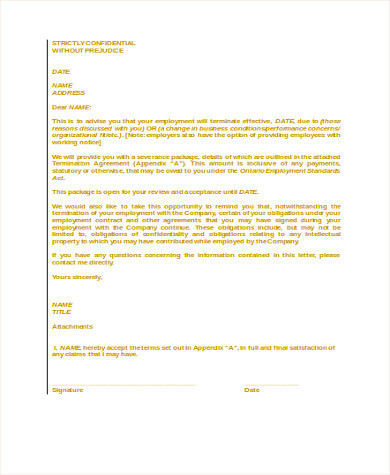 When writing termination letters, make sure to make two copies duly signed by the employee. One copy is for the employee and one copy is for the company. 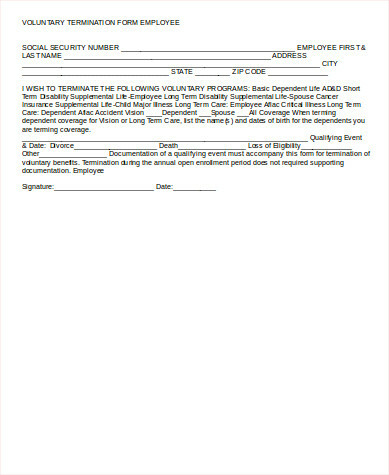 This is to ensure that you have a record of this document in the employee’s file. In cases where you want to terminate a tenant’s lease, check our Lease Termination Form. Before ending your employee’s contract with the company, a written notice about his termination should be in order. This is a standard procedure in large companies. It is an essential final step to communicating a reason that would be easily interpreted by the employee in terms of his/her termination. 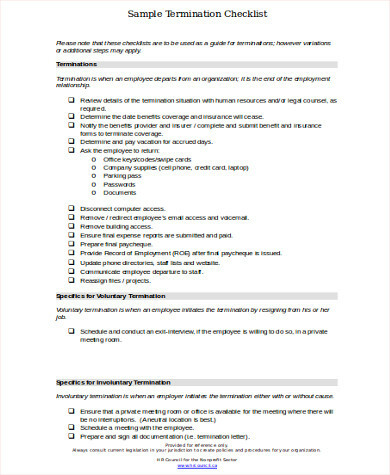 Make sure that you review the termination forms before handing it to the employee. This guarantees that there are no loopholes in the letter and that everything abides by the company’s terms and conditions. 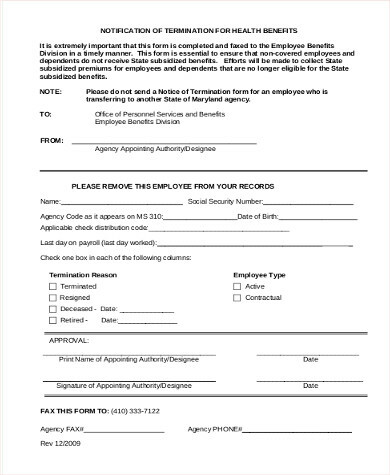 The purpose of these forms is to help with having a more convenient of writing a termination letter that would be professional and formal. 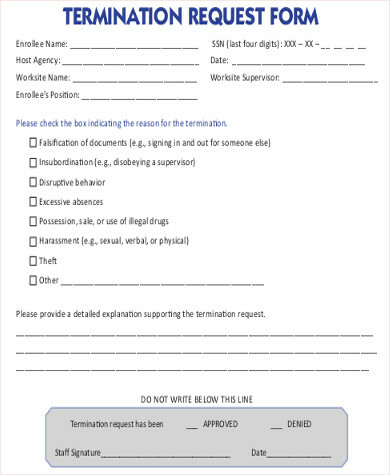 These templates could help human resource officers, managers, supervisors, and team leaders become more knowledgeable when it comes to writing termination letters. 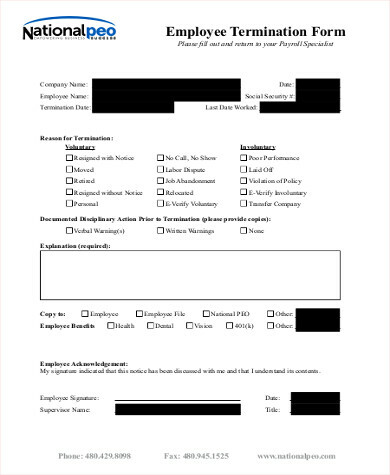 You can also see Sample Employee Application Forms.